Hundreds of Romanian magistrates held a silent protest in support of an independent judiciary in capital Bucharest on Sunday after a slew of legal changes by the ruling Social Democrats in one of the European Union's most corrupt states. Since taking power last year, the party has embarked on a process to overhaul the judiciary and change legislation to decriminalize several graft offences. Several party members, including leader Liviu Dragnea, are under investigation or on trial for corruption. Justice Minister Tudorel Toader pushed through the dismissal of chief anti-corruption prosecutor Laura Codruta Kovesi earlier this year and is currently reviewing the country's prosecutor general. The Social Democrats' legal changes have raised concerns over the rule of law from the European Commission, which is keeping Romania's justice system under special monitoring, the U.S. State Department and thousands of magistrates, while triggering the country's largest street protests in decades. 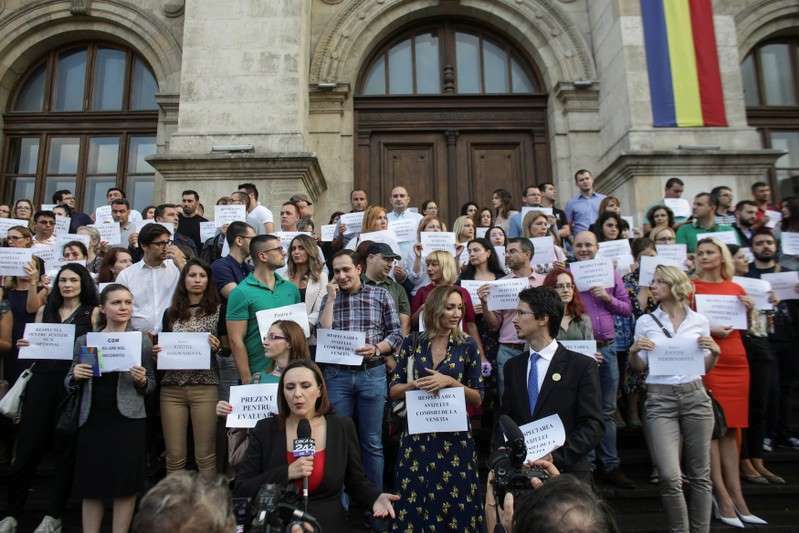 On Sunday, magistrates stood on the steps of Bucharest's Court of Appeals holding banners which said "For an independent justice". "The independence of judges and prosecutors is not their privilege or a personal prerogative but a necessity to ensure that the judiciary is capable through its institutions to fulfill its purpose," Prosecutor General Augustin Lazar said in a statement. Judges and prosecutors were protesting changes to the criminal code, supporting the prosecutor general and asking that lawmakers consult the Venice Commission, the Council of Europe's advisory body on constitutional matters. They have held two similar protests in recent months. "There is political interference in the justice act, and the changes to criminal procedures and the criminal code depart from international standards," one magistrate said. The Constitutional Court meets on Monday to discuss challenges brought by opposition lawmakers against changes to the criminal code. The Venice Commission is expected to issue an opinion on the changes in mid-October. Concerns over the rule of law in Romania follow similar issues seen in Poland and Hungary, where governments are under pressure from the EU over democratic standards.